St. Jude Medical, Inc. (NYSE:STJ), a global medical device company, today presented favorable results from the largest observational study to date of the company's AMPLATZER™ Amulet™ left atrial appendage (LAA) occluder. The data were presented in a Late Breaking Clinical Trial session at the Transcatheter Cardiovascular Therapeutics (TCT) Conference in Washington, D.C. The prospective, multicenter, international AMPLATZER Amulet Observational Study of LAA occlusion (closure) enrolled 1,073 patients at 64 centers across 18 countries. Initial results from the study showed a 98.8 percent implant success rate adding to the clinical evidence that the AMPLATZER Amulet LAA Occluder is a safe alternative for prevention of stroke in patients with non-valvular atrial fibrillation (AF). The AMPLATZER Amulet LAA Occluder is used to close the LAA (an appendage of the left atrium) in patients diagnosed with non-valvular AF. Atrial fibrillation occurs when the upper chambers of the heart (atria) contract rapidly and irregularly, which can disrupt efficient pumping of the blood out of the heart. Blood that pools in the atria can clot and, if the clot moves to an artery in the brain, stroke may occur. Studies have shown that AF can dramatically increase the risk of stroke for patients and for many patients, medication has historically been the option physicians turn to most often. "Patients with atrial fibrillation at risk of stroke are usually prescribed anticoagulant medication, but this treatment comes with some limitations. Patients might not tolerate the medication, plus there's a risk for major bleeding," said Dr. David Hildick-Smith from Sussex Cardiac Centre at Brighton and Sussex University Hospitals Brighton, United Kingdom and principal investigator of the AMPLATZER Amulet Observational Study. "By closing the LAA with the AMPLATZER Amulet device, physicians can seal off the LAA, with the objective of reducing the risk of stroke and eliminating the need for oral anticoagulants." Closure rate was 99 percent at one to three month follow-up visit (n=364). Closure was defined as absence of flow or flow of < 3 mm jet into the LAA. All echocardiography results were adjudicated by an independent core lab. Acute device/procedure related major adverse events within seven days post procedure occurred in 2.7 percent (29) of 1,073 patients. "Initial data from this large-scale observational study continue to affirm the AMPLATZER Amulet LAA Occluder as an important treatment option to reduce the risk of stroke in patients with non-valvular AF," said Dr. Srijoy Mahapatra, medical director and vice president of medical affairs at St. Jude Medical. "The AMPLATZER Amulet Occluder has favorable closure rates when compared to other device reports in a similar patient group." The AMPLATZER Amulet Left Atrial Appendage Occluder is CE Mark approved, but remains an investigational device in the United States. 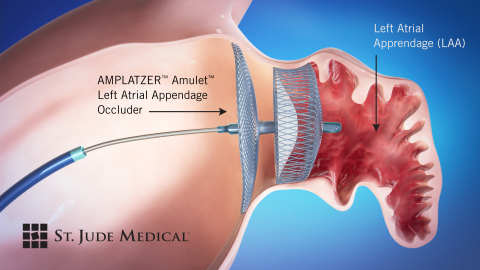 In September, St. Jude Medical announced the start of the AMPLATZER™ Amulet™ LAA Occluder IDE trial, evaluating the safety and effectiveness of the company's AMPLATZER Amulet occluder device. The trial will enroll patients at up to 100 sites in the United States and an additional 50 sites internationally. The shape and size of an LAA can vary greatly. The AMPLATZER Amulet LAA Occluder has a conformable disc and lobe designed for complete occlusion of the LAA and offers the broadest size range available. The device offers physicians options to help meet the anatomical demands of patients in need of LAA closure. During AF, chaotic electrical signals in the heart's upper chambers (atria) beat erratically and out of sync with the two lower chambers, resulting in poor blood flow. The LAA is a tube-shaped appendage connected to the left atrium of the heart that can potentially hold static blood during an episode of AF, increasing the likelihood of clot formation. Research shows that in AF patients, approximately 90 percent of all cardiac blood clots form in the LAA. If a clot forms in the LAA and is then released into the heart, it may enter blood circulation, travel to the brain, block a vessel and cause an ischemic stroke. The current standard of care to treat ischemic stroke in AF patients is blood-thinning medications, which comes with major, sometimes fatal, bleeding risks. According to the World Health Organization (WHO), an estimated 15 million strokes occur worldwide each year. In 2010, stroke cost the United States an estimated $53.9 billion in health care services, medications and missed days of work.